Founded in 2012, and headquartered in Florida, Colonial Van Lines is a moving company that offers long-distance relocation services to both residential clients and businesses in the lower 48 states. They move nearly 20,000 customers every year, and they also offer storage services. 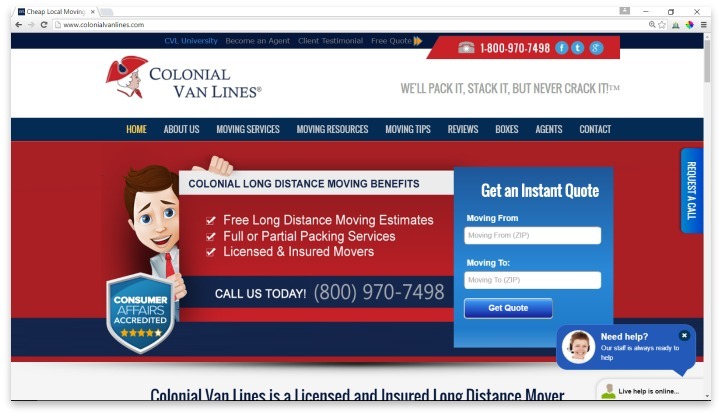 At first glance, Colonial Van Lines does not offer quite as many services as many other moving companies. They don’t have any special experience with antiques or pianos, nor do they handle automobile shipping. However, what they do do, they do very well. Colonial Van Lines is one of the few moving companies that maintains an overwhelmingly positive reputation in user reviews, with over 75% of all reviews reporting a great experience. They offer a mobile app that allows consumers to get a quote, or you can choose to get a free quote online. They are one of the few moving companies that do not require contact with a customer service agent to receive a quote, and their prices seem to fall in the industry standard. Under-estimating the cost does seem to be a common concern among user reviews, so it’s especially important to be as accurate as possible when reporting the amount and types of items you need moved. Like a large majority of their competitors, Colonial Van Lines does not move your household or office themselves. Instead, they act as coordinators, and rely on third-party movers to get the job done. This means that every single user experience will be different; while Colonial Van Lines claims to hire only the highest quality partners, there are many reviews that state that the third-party movers were not careful or timely with their services. However, while most similar services seem to fluctuate between horrible movers and simply “ok” movers, Colonial Van Lines does have a higher percentage of reviews that indicate that the movers went to extra lengths to take special care of their furniture and belongings. Colonial Van Lines does offer a lot of great information on their website for movers, including check lists, information about your responsibilities when hiring a mover, and tips for making moving less stressful. They also sell boxes and packing materials directly through their website, so its easy to get a feel for their customer service and timeliness by ordering supplies before you hire their moving services. For the most part, customer service seems to be hit or miss, with certain lines (such as the live chat option) being very friendly and helpful, while others (such as the phone line) being busy or unable to help. Colonial Van Lines offers long-distance residential and business relocation services in the lower 48 states, and they also offer storage services. If you are moving to another state, and can’t or don’t wish to do all the packing and moving yourself, Colonial Van Lines stands out from its competition with overall better reviews, and a focus on providing just a few services extremely well. While there are still some concerns about customer service and the service of the unknown third-party you’ll be dealing with, Colonial Van Lines still presents one of the best moving services out of all its competitors. If you are careful to report your belongings accurately when getting an estimate, and plan for unexpected costs, you should find that working with Colonial Van Lines makes your move much easier. Have you had an experience with this company? Please share your Colonial Van Lines reviews below. The crew is awesome. They guy did smoke a lot though. But all my stuffs made it safely. - CONS: The guys smoked near my residence. Okay, you are entitled to your break (It was a long loading time). But be mindful of proximity of non smokers.